Most people are completely unaware that some of the most popular ‘charities’ (or NGOs: Non Governmental Organisations as they are more accurately called) actually divert large amounts of their income to political propaganda. And in many cases the brunt of this political propaganda is directed against Israel. The UK government and the EU are especially big donors to a whole host of anti-Israel NGOs (some of the worst of these even receive funding from the UK Lottery - see below). To get a feel for the damage these 'charities' cause to Israel read this article by Tuvia Tenenbaum who infiltrated EU-funded NGOs operating in Israel pretending to be a German anti-Zionist. NGO Monitor continually provides updates of this type of activity, but I felt a simple summary was needed, since every week or so I end up having to tell a friend that the charity they or their children are asking us to contribute to is actually helping to fund the deligitimization of Israel or even worse, directly funding Palestinian terrorists. Following the lead of Debbie Schlussel I have awarded a number of Arafats (rather than stars) to each charity (where 5 Arafats is the worse possible). The list - ordered by the fame of the charity - is by no means exhaustive. 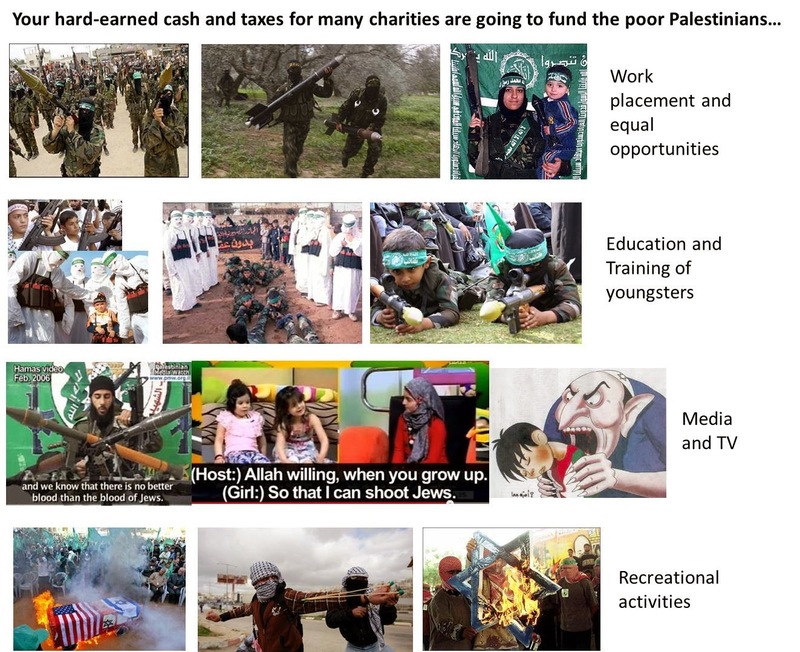 It does not include the many specifically ‘Palestinian’ charities, such as Interpal, and Muslim charities, such as Muslim Hands, and Islamic Relief which directly fund Hamas and other islamic terrorist organisations. But I would not expect any rational person to be in any doubt about the purpose of such ‘charities’. Has become increasingly obsessed with partnering groups who have an anti-Israel pro-terrorist agenda and continues to fund a Palestinian media organisation that puts out Jewish blood libels to its Arabic readers. Especially concerning is its active campaigning to boycott Israel which resulted, for example, in its decision to force out Scarlett Johansson as one its 'amassadors' simply because she featured in an advert promoting an Israeli company (which incidentally provides very good employment opportunities for Palestinians). During the 2014 Gaza conflict Oxfam openly supported Hamas and even backed up Hamas's demand of a sea port to import weapons by staging a major stunt in central London. In case anybody thinks that Oxfam's obsessive anti-Israel fetish has anything to do with the 'occupation' they should read this. Oxfam also uses its website to promote well known antisemites and Jihadists. One thing this charity does not do is aid Christians since its current focus is on supporting Hamas and attacking Israel. Its own web site shows its active campaign to boycott Israel. In the wake of genocide committed by Islamists against Christians in the Middle East (something Christian Aid has nothing to say about), Christian Aid actually released this video anti-Israel video. If it really does save any children (highly unlikely given the amount it spends on political propaganda, including much directed against Israel) it certainly refused to save Jewish children as evident from its disgraceful anti-Semitic stance during the 2009 Gaza war. Moreover, this 'charity' campaigned vehemently to stop Israel building its security fence. Thankfully the charity's efforts in this respect failed - which meant that Jewish children really were saved. In August 2016 it was discovered that one of Save the Children's employees in Gaza was a member of Hamas. Not surprising for an organisation that was led by George Galloway, this completely misnamed ‘charity’ is almost entirely dedicated to funding anti-Israel propaganda and actually boasts of leading the boycott Israel campaign. It receives a massive chunk of its income every year courtesy of the BBC’s Comic Relief whereby unknowing Brits (mostly youngsters) send in their hard earned cash thinking it will go directly to help the starving in Africa. Shamefully, it also receives regular funding from the British Government and the EU. Update (17 Feb 2015): War on Want's War against the Jews. Also worth noting that if you buy Innocent products (smoothies etc) or shop in Lush then you are funding this 'charity'. Under no circumstances should any rational person ever buy a red nose, since the major recipients of this mega-charity are none other than Christian Aid, Oxfam, Save the Children and War on Want (see rest of this posting on those charities). What makes this charity even worse is the whole BBC cover-up of where the money really goes. Note that Sport Relief is part of Comic Relief. As confirmed by its own website here, all of the money raised by Sport Relief is spent by Comic Relief. So please see Comic Relief above. To fully understand why organisations like the Red Cross and a range of European Union charities operating in Israel and the Palestinian areas have doen so much to destroy any prospects for peace you must read this article by Tuvia Tenenbaum who infiltrated these organisations pretending to be a German anti-Zionist. In Nov 2015 the ICRC came out in support of the Palestinian Red Crescent after one of its ambulance refused to treat Jewish victims of a terrorist attack. The Red Cross are also heavily involved in the funding of Palestinian terrorists. Based on this organisation's activities the definition of 'human rights' and 'war crimes' is very different for Israel than any other country in the world. It has an obsession with singling out Israel (often for instances of 'abuse' that are far less serious than what happens in the UK and USA) while ignoring the really serious stuff committed by all of Israel's Arab neighbours; the fact that its Middle East 'researchers' are actually committed anti-Israel activists says it all. Put simply this organisation is racist since it does not expect decent behaviour from Muslims and therefore generally turns a blind eye to the terrible abuses in the Muslim world. Its report on the 2014 Gaza war is a perfect example while in Nov 2014 it compared Israel to ISIS. It is also a genuinely antisemitic organisation since it has a long record of both honouring and hosting vicious antisemites at its meetings and stopping Jews from even asking questions; moreover AI played a key role in the most antisemitic international meeting to take place in recent years (the infamous Durban conference). Elder of Ziyon has a catologue of Amnesty's blatant lies and Hamas-supporting propaganda against Israel.In August 2015 it was revealed that one of their Directors has undeclared private links to men alleged to be key players in a secretive network of global Islamists. In Dec 2016 it was reported that Amnesty attack democracies and support Islamic tyrannies. This appallingly anti-Israel NGO has the distinction of having had one of its employees from Gaza arrested for plotting to assassinate the Israeli Prime Minister (Ehud Olmert) in 2007. See here, here, and here. A comprehensive recent update of their antisemitism and Israel hatred is provided here and their open support for Hamas here. They also collaborate with, and lie on behalf of, the Taliban. A very curiously named 'charity', given its political anti-Israel agenda, and the fact that money which presumably was supposed to be spent 'fighting hunger' actually funded a notorious anti-Israel documentary. Manages to be not just ferociously and obsessively anti-Israel but also antisemitic. Happy to starve children to serve its antisemitic profile. Also see my report on UNICEF 'ambassador' Mia Farrow's visit to Gaza in 2009. As this account makes clear UNWRA is Hamas, despite the fact that it receives over a billion dollars annually from EU and US taxpayers. UNWRA runs all the Palestinian schools in Gaza indoctrinating children to become future terrorists as catalogued here. During the Gaza war of 2014 UNWRA not only allowed Hamas to fire rockets from its schools, but actually stored the rockets there for Hamas. There are many of these tracked by NGO Monitor and they include most of the Israeli-based anti-Zionist organisations that are also supported by the New Israel Fund (see below) such as Breaking the Silence, Adalah and B'Tselem. A good example of one such charity that is actually based in the UK is Medical Aid for Palestinians (MAP). Almost all of its £3.1 million income in 2014 seems to have spent on anti-Israel political activity rather than medical aid. Of this amount the UK government gave £725,000 from its overseas aid budget (you know the one that Cameron keeps telling us is used only to feed the starving Africans) and incredibly they also received an undisclosed amount from the UK Lottery. many of which are dedicated to the destruction of the Jewish state. These include Breaking the Silence which demonizes Israel through the fraudulent testimonies of anti-Zionist former members of the IDF, Adalah which calls for eliminating Israel’s Jewish framework, B'Teslem (which provides logistic support for terrorist-supporting organisations like ISM) and five organisations Machsom Watch, Coalition of Women for Peace, Women Against Violence, Social TV, and Mossawa that all signed a letter sent to the Norwegian Government Pension Fund demanding divestment from Israel. In Feb 2015 it was revealed that a lawyer (Michael Sfard) was paid by the New Israel Fund to provide expert testimony for the PLO in its defence against US terrorist victims. See also: These 'Jewish' organisations that claim to be 'Pro-Israel, pro-peace' but are actually simply anti-Zionist: For people in the UK, especially note OneVoice and Yachad. This above list is by no means complete - I will be continually updating it. We all give the bbc £145.50 p.a. How many arafats there ? The New Israel Fund with its benign name even had an event sponsored at The Temple an Atlanta Jewish reform synagogue. I am sure many people are fooled by its name. If you choose to donate money to a Sadaqah Jariyah project, you will keep receiving rewards for your kindness as long as people benefit from it. The last "Anonymous" person to comment is ignorant and a true anti-Semite. The Kazaars did exist, but only remained Jewish for a short period. The majority of Western Jews are truly Semitic, with numbers having arrived in Europe and Asia during the time of the Roman Empire. Ignorance is bliss, but only for ignorant and hateful people! Actually, if you want to get technical, according to the science of human genetics and mitochondrial DNA...we're all from Africa. We all have a common female African ancestor..so no matter where you call home, what land you're from or whose land you stole- We're all family...and the lives of all good people matter. The only dividing line between human beings, that creates an "us and them" is the sociopaths/psychopaths (who make up 1 out of every 25 people)...and the rest of us non-sociopaths who just want to honor the Golden Rule...live with peace, fairness, equality and try to have a nice life. This is why hundreds of thousands of kids go hungry and Israelis are in poverty. Greed.